Heathrow, the busiest airport in Europe, has fallen behind Edinburgh in terms of the number of domestic passengers. Over the past 12 years, the number of travellers on UK flights to and from Heathrow has dropped by 28 per cent. Last year it handled an average of just over 13,000 domestic passengers per day, compared with over 18,000 in 2005. Over the same spell, the airport’s overall passenger numbers have increased 26 per cent. Edinburgh, Scotland’s busiest airport, has also seen a drop in domestic passengers while its overseas numbers increase. But the decline was only 14 per cent, allowing it to take over top position from Heathrow. The figures appear in the new edition of the Anker Report, compiled by Ralph Anker. He believes Air Passenger Duty, which doubled in 2007, has played a part in the overall reduction in domestic passengers; the tax now adds £26 to a round-trip within the UK. “The charge is applicable to all passengers departing from a UK airport, which means that a domestic passenger is charged for both sectors of a return journey,” he said. Eight domestic airports are currently served from Heathrow: Aberdeen, Belfast City, Edinburgh, Glasgow, Inverness, Leeds Bradford, Manchester and Newcastle. The only route to have been lost since 2005 is Durham Tees Valley, though frequency has dropped on many routes. British Airways recently halved the number of flights between Leeds Bradford and Heathrow. At present UK airports have far more links with Amsterdam, Dublin and Paris than with Heathrow. Heathrow Airport has argued that a third runway would allow it to increase dramatically the number of UK destinations served, saying: “An expanded Heathrow could enable flights to new destinations such as Liverpool and Newquay. The airport this year increased the domestic passenger discount from £10 to £15. MPs are due to vote this summer on expanding Heathrow. The third runway is being backed by easyJet, which has plans for a domestic network based at Terminal 4. A spokesman for Edinburgh Airport said: “The growth in our long-haul routes, from one in 2007 to 12 in 2018, means more passengers are now getting to their end destination directly from Edinburgh rather than having to travel through Heathrow, and that is highlighted in the spectacular growth in our international passengers. The second Scottish airport, Glasgow, takes third place, despite a fall of 7 per cent over the 12-year spell. Gatwick and Belfast International are catching up, with increases of 4 and 10 per cent respectively. 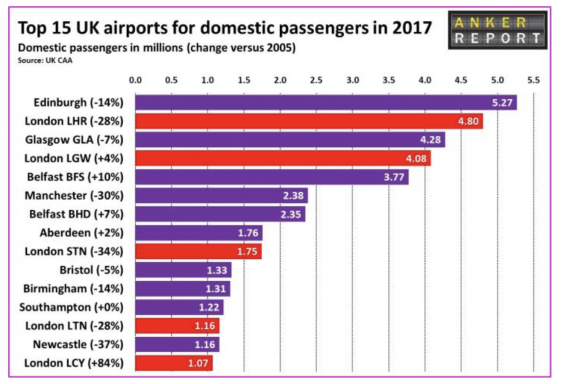 Among the biggest airports, Stansted and Manchester have lost the most traffic, falling 34 and 30 per cent respectively. In 2005, easyJet had a busy route between the Essex airport and Newcastle, and the now-defunct Air Berlin launched a domestic network from Stansted. Last year Ryanair abandoned its winter routes from Stansted to Edinburgh and Glasgow. Also in 2005, Manchester airport had frequent flights to Heathrow on both British Airways and BMI, as well as busy links to London City, Gatwick and Stansted. Today only BA serves the Manchester-Heathrow route, and the only other London airport with a domestic flight to Manchester is Southend, served by Flybe. Rail links with the capital have become faster, more frequent and more reliable. A spokesperson for Manchester Airport said: “The main reason why we have probably seen the drop in London traffic is due to our phenomenal long-haul growth in recent years. “Over the last couple of years we have added routes such as Beijing, San Francisco, Boston, Houston, Muscat, Los Angeles and just today we have announced Addis Ababa. Posted: Wednesday, May 16th, 2018. Filed in General News, News about Airports, Recent News.